Andy Reid, head coach of the Philadelphia Eagles and possible Yosemite Sam impersonator, has gone on record that he is growing out his mustache because he can no longer grow hair. I applaud him. Most older men who can no longer grow hair simply grow out their eyebrows and ear and nose hair. This entry was posted in Old Man Steesh, Sports Steesh and tagged Andy Reid, coach, entertainment, Football, Humor, Moustache, mustache, nfl, Philadelphia, Philadelphia Eagles, sports on August 1, 2012 by Los Bulls. 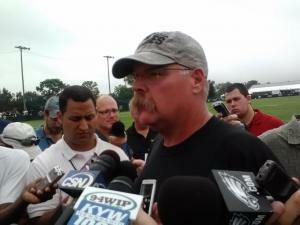 Since when did the Eagles hire Wilford Brimley? Are the Eagles now going to be sponsored by oatmeal and diabetes? Andy trying to look like country singer Trace Adkins?